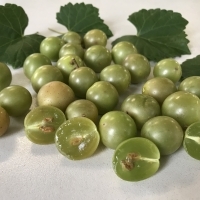 Muscadines are well adapted to the warm, humid conditions of the south-eastern U.S. and therefore will grow well in all humid areas of Australia where European grapes are unsuitable. Both east and west coasts and through the “top end” provide the climatic requirements for growing muscadines successfully. Its lack of frost hardiness also limits it to this same region. It should therefore be suited to regions North of Sydney and Perth that are free from heavy frosts. From Cape York in Queensland and Darwin in the Northern Territory through to the north-west of Western Australia. Muscadines are vigorous, deciduous vines growing 18-30 mts. in the wild. 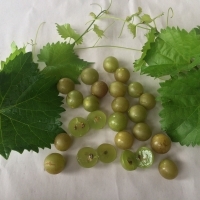 Botanically, they differ in significant ways from other grapes and are placed in a separate sub-genus, Muscadinia. In contrast to most other grapes, muscadines have a tight, non-shedding bark, warty shoots and unbranched tendrils. 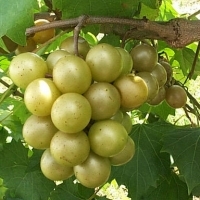 The fruit is borne in small, loose clusters of 3-40 grapes, quite unlike the large, tight bunches characteristic of European and American grapes. The round, 25 to 40mm fruits have a thick, tough skin and contain up to 5 hard, oblong seeds. In colour the fruits range from greenish bronze through bronze, pinkish red, purple and almost black. Sugar content varies from about 16% to 25% for the sweetest cultivars. The wild fruits and some older cultivars have a musky quality similar to American grapes, although not as pronounced. Modern cultivars have a unique fruity flavour with very little muskiness. 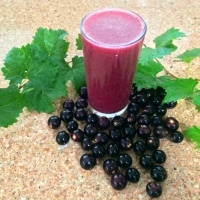 The flavour and appearance of the dark coloured muscadine fruits are remarkably similar to the jaboticaba. As with all grapes, muscadines need full sun with good air drainage. Annual pruning must be severe to keep new fruiting wood coming and to prevent vines from becoming tangled masses of unproductive wood. The basic framework of a vine consists of the trunk, permanent arms, and the fruiting spurs. Vines must be pruned each dormant season to maintain this framework. Current season shoots bear the fruit, but to be productive, these shoots must arise from buds set on last season's growth, since shoots from older wood are generally sterile. 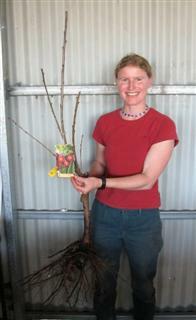 It is important to leave the correct amount of fruiting wood.